Some days, when you're blogging, you really have nothing to say. Or at least I do. On those days, I'll usually scour the news for something worth writing about. There's always something going on. A worse problem, in my opinion at least, would be having to run staff meetings on a regular basis. Our school, multi-session and chronically overcrowded, is not on the Mulgrew/ Fariña teacher torture plan, so we still have monthly faculty and department meetings. I don't envy the supervisors at all. Every month they have to come up with something to meet or talk about. I've been doing this for thirty years now, and every now and again I come upon some meeting leader who is, shall we say, less than inspired. I guess there's always some nonsense to read or talk about, but don't sentient supervisors recognize when the mandated topics really don't merit a mention? In fairness, sometimes they do. 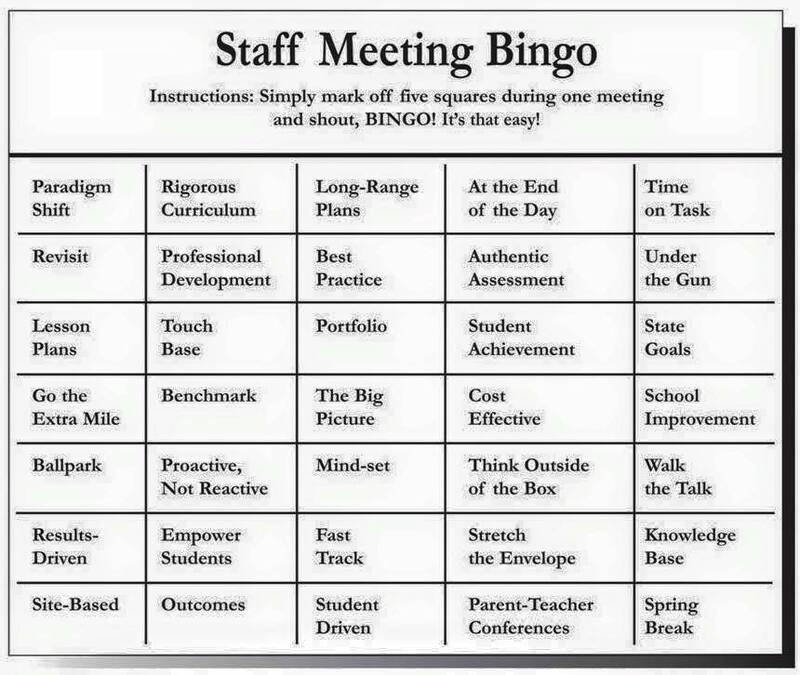 At a memorable faculty meeting, a supervisor came to us with a revolutionary new program that consisted of a renamed motivational activity. I can't remember the term. Maybe it was tipping-off activity. He also said we needed to use the words, "each, every, and all" of you. He said that would surely grab the attention of your students. He said this in a tone dripping with sarcasm, and it was obvious he did not buy it at all. I didn't either. I generally address my class as, "ladies and gentlemen," and while I'm not sure why I do that, I'm certain the "each, every and all" thing would have no effect whatsoever. I'd like to see more such presentations. It would be a lot more interesting when the Next New Thing came out to see a supervisor making tired faces and acknowledging with us that it was just some trendy crap that would end up on next year's junk heap, replaced by the Next Newer Thing. Sadly, I've seen very few supervisors who grasped that concept. More supervisors have embraced The Thing enthusiastically, and had no problem telling us how indispensable It is. They tend to show little to no awareness that they told us about some other indispensable thing just last year. While I've seen New Things almost every year since I started teaching, it's become more egregious lately, with the advent of junk science teacher ratings. Now not only is there new crap to deal with, but it's also confirmed by the American Statistical Association to be crap. Not only that, but it's high stakes crap and your job depends on it. In the short run, here's not a whole lot we can do about it. It's particularly tough with a union leadership that embraces and supports every shiny piece of crap that comes down the pike--mayoral control, charter schools, co-location, two-tier due process, whatever. UFT President Michael Mulgrew was part of a team that designed the original junk science law, and when Cuomo and the Heavy Hearts Assembly rendered it even more draconian, he, or whoever writes his memos, actually thanked them for it. That's just a little depressing. But be of good cheer. When you go to the first staff meeting of the year, you can divert and amuse yourself by printing out the illustration above. 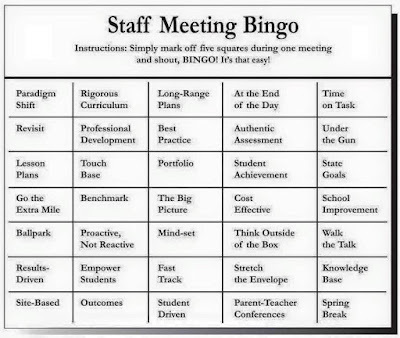 Listen for each platitudinous pronouncement, and once you hit five you can yell "Bingo!" and break the thing up. Make sure the papers are widely distributed so you aren't the only one yelling. Always remember--in union there is strength.